Wigston Menphys Nursery School provides highly specialised education, health support and therapy to vulnerable nursery age children with a range of disabilities and life-limiting health conditions. One of only two specialist centres covering the whole of Leicestershire, Wigston Menphys Nursery School is staffed by a highly trained, immensely committed team supporting over forty children between the ages of 2 and 5. We have a fund raising group called ‘The Friends of Menphys, Wigston’ who raise money to enable us to continually improve the environment and opportunities we can offer the children. This is at present a small group and we are looking for volunteers to join and help with fundraising activities. If you are interested in joining this group please telephone the office 0116 2889977. 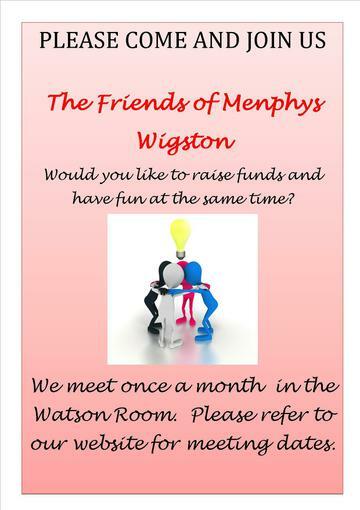 The friends of Wigston Menphys is a group of parents, carers, friends and members of nursery staff who meet regularly to organise social and fundraising events such as quiz evenings and the summer fair. All funds that are raised are used to enhance opportunities for children and their families. Funds are used to purchase toys and equipment to enhance the learning environment and to facilitate special events for children and their families. Meetings are usually held approximately once a month during term times and new parents and friends are warmly welcomed to join the group. Please contact the nursery if you would like to find out more. We welcome any fundraising ideas that you might be able to share as the financial support provided by the group is of huge benefit to the children's learning and development. Christmas Activity Afternoon & Meeting Santa!